The original recipe of Owren´s Buffer (Owren´s Buffer Polybrene, GHI152) is intended for dilution of samples in connection with laboratory diagnostic analysis valid for the coagulation system, mainly when analysing Prothrombin complex Activity (Owren´s PT-activity). Samples can be citrated plasma, capillary blood and citrated blood. Owren´s Buffer Polybrene (GHI152) contains 5mg/L Polybrene and therefore neutralizes Heparin. Owren´s Buffer Polybrene (GHI152) may also be used for determining specific coagulation factors such as VIII, IX, VII and X. and also when analysing fibrinogen, antithrombin and D-dimer. Diluent, for purpose of reconstitution of lyophilised coagulation reagents and controls, where water of a high purity grade is required and the addition of 4 mM NaN3 is not disturbing. Calcium Chloride (25 mM CaCl2) solution for Owren’s PT and APTT analysis. 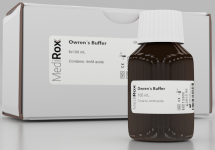 The original recipe of Owren´s Buffer (Owren´s Buffer, GHI150) is intended for dilution of samples in connection with laboratory diagnostic analysis valid for the coagulation system, mainly when analysing Prothrombin Complex Activity (Owren´s PT-activity). Samples can be citrated plasma, capillary blood and citrated blood. Owren´s Buffer (GHI150) may also be used when determining individual coagulation factors such as VIII, IX, VII and X and also when analysing fibrinogen, antithrombin and D-dimer. 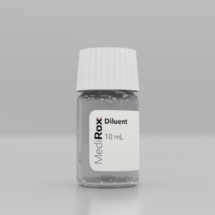 Sample Diluent (0,9% NaCl) for purpose of dilution of test plasmas and calibrator plasmas for the Fib Clauss, Antithrombin and D-Dimer assays. PT Buffer Polybrene, barbitural free (MRX152) is identic to Owren´s Buffer Polybrene (GHI152) but without content of barbitural. The intended use is for dilution of samples in connection with laboratory diagnostic analysis valid for the coagulation system, mainly when analysing Prothrombin complex Activity (Owren´s PT-activity). Samples can be citrated plasma, capillary blood and citrated blood. PT Buffer Polybrene (MRX152) contains 5mg/L Polybrene and therefore neutralizes Heparin. 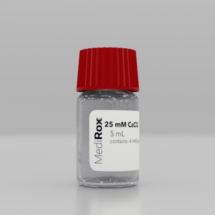 Owren´s Buffer Polybrene (MRX152) may also be used for determining specific coagulation factors such as VIII, IX, VII and X. and also when analysing fibrinogen, antithrombin and D-dimer. PT Buffer, barbitural free (MRX150) is identic to Owren´s Buffer (GHI150) but without content of barbitural. The intended use is dilution of samples in connection with laboratory diagnostic analysis valid for the coagulation system, mainly when analysing Prothrombin Complex Activity (Owren´s PT-activity). Samples can be citrated plasma, capillary blood and citrated blood. PT Buffer (MRX150) may also be used when determining individual coagulation factors such as VIII, IX, VII and X and also when analysing fibrinogen, antithrombin and D-dimer.